Oh dear, 5 weeks without an update! Yup Utrainia has been floundering a little bit with very little to show for February. I'm not entirely sure where the time went, but I think I have been suffering from too many choices, not enough direction. To fix that, I've made an online todo list in my favourite job tracker, Trello. Each project has its own card with a checklist of little baby steps. Even something as small as cutting out some cardboard has an entry. Now whenever I sit down for some train time, I have direction and focus, and everything I do can be towards my current project. And so far it is showing good results. Witness: the fiddle yard! A fiddle yard is a very British thing, being used to keep several trains on the layout, but not actually occupying valuable siding or station space. I decided I needed one so that I can have a selection of trains available to run on my mini modules, without having to lift trains off and back on the rails every time I wanted a change. The module followed my usual structure: 3mm MDF skin covering a pine base. 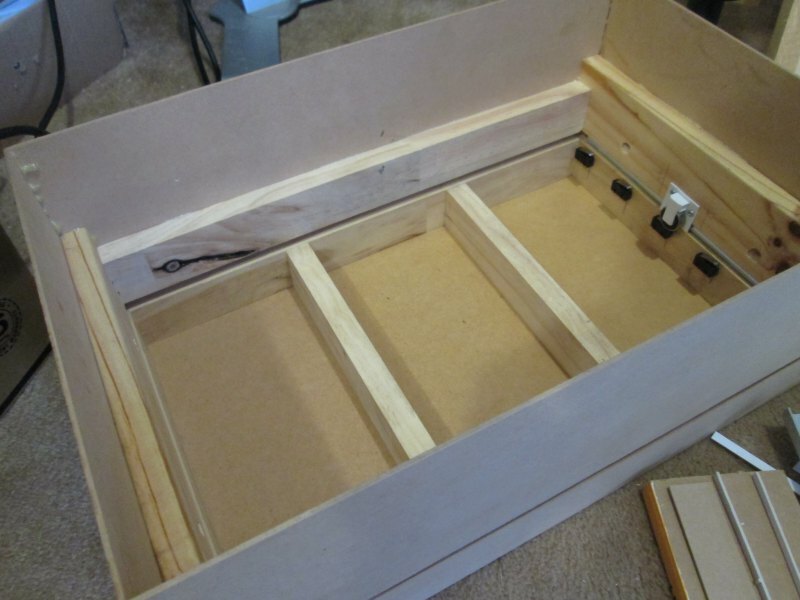 Drawer runners sit between the top and bottom half so that the top can slide sideways, lining the selected track up with the next module. On top of the MDF I laid a layer of cork flooring tile, which is a perfect 5mm hight. 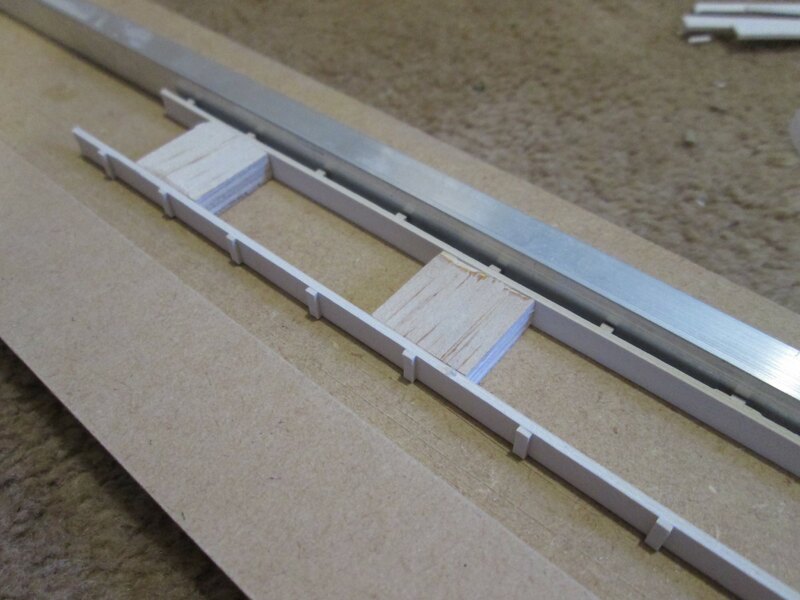 Next I cobbled together some scraps of track and made 5 tracks. PCB sleepers at the end ensure things stay lined up and correctly spaced. It is important to only energise the currently centered track, otherwise all the parked trains would drive off together into the abyss, resulting in massive loss of life! 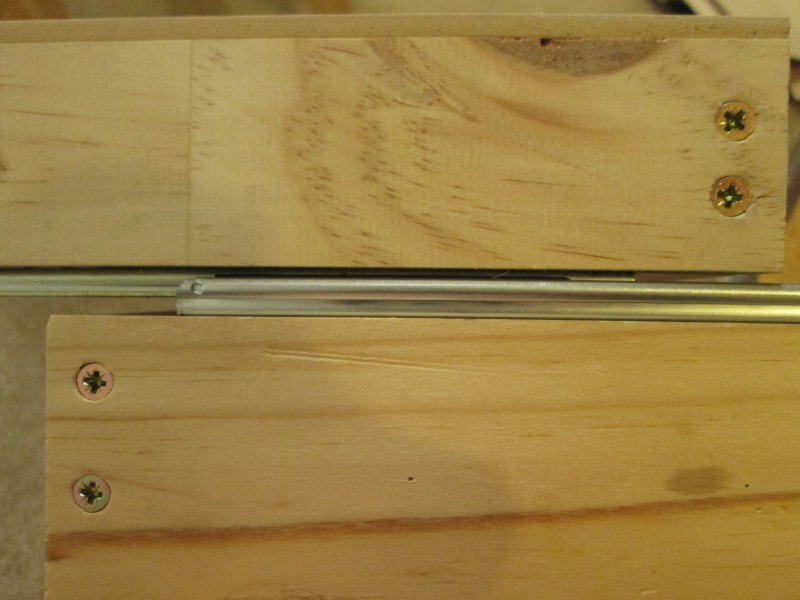 So I glued 5 micro switches underneath the top layer, and made a "depressor" out of a spare ball bearing and some styrene. Now as the top tray is moved across, each track in turn gets switched on as it passed the centre spot. 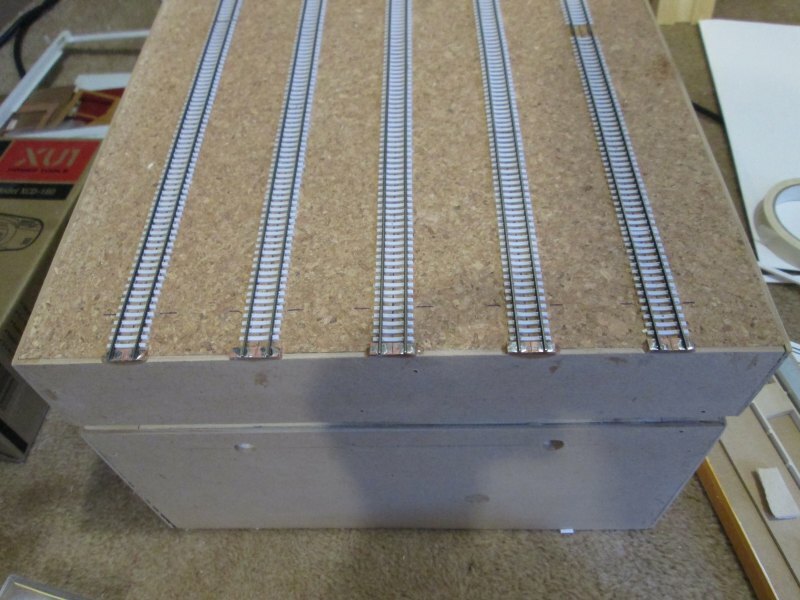 I haven't wired up the tracks yet, but that is on my Trello card. 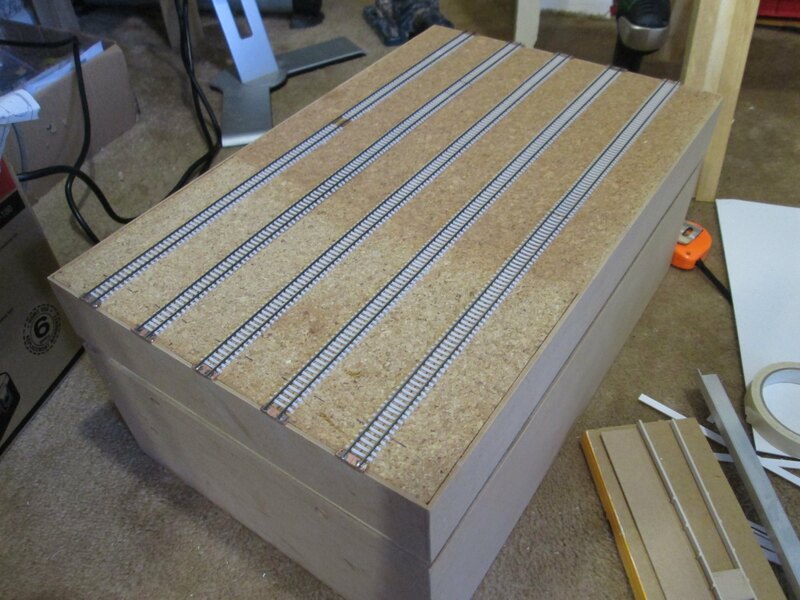 One thing I wanted to do is make this fiddle yard not just functional, but also visually part of the railway. Five rows of equally spaced tracks could be a generic yard, or â€“ far more interestingly â€“ it could be a station. 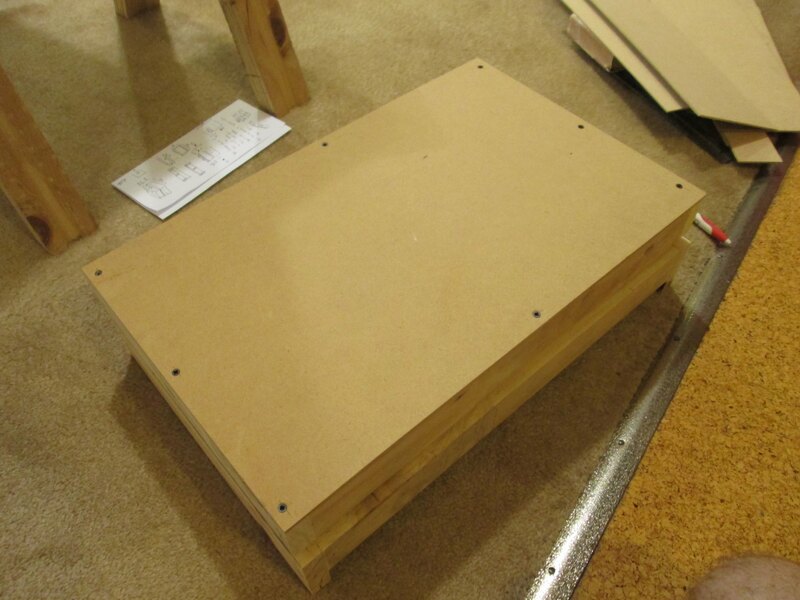 Platforms are the first item on the list, so I made these up out of precision cut-planed-sanded 3mm MDF tops, with 7mm ply spacers, and 1.5mm cardboard sides. On to the sides I stuck some 1mm card relief to break up the monotony. I had planned to make up a silicone mold and cast the platform edges, complete with molded in tactile platform edging etc, however I soon ran into problems and after a few false starts I settled on this "lo-fi" approach of cardboard and wood. Simple, but quick! 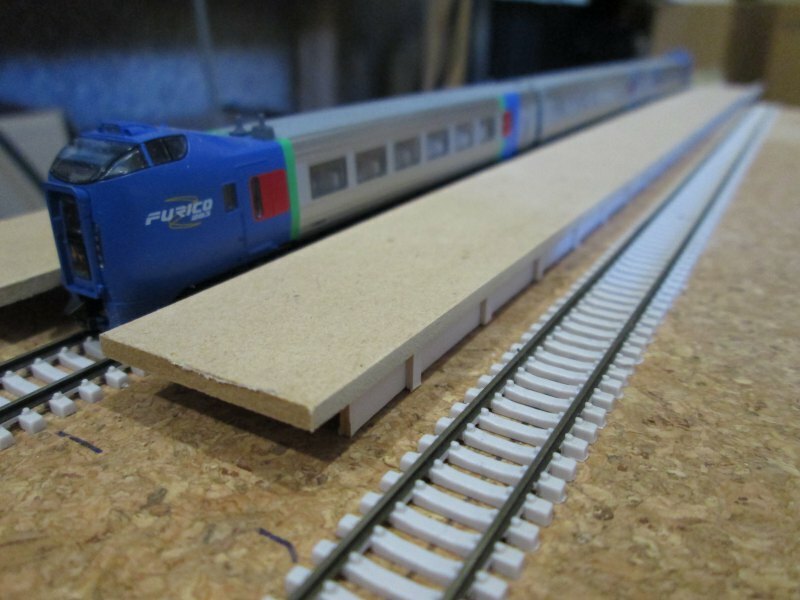 The module is only 475mm long, which is just big enough for a 3 car train, be it 3x Shinkansen, 3x EMU, 3x DMU, 2x carriages + a steam engine, or a small freight train. I decided to go small so that I didn't get carried away. If I need to, I can create another identical module and bolt it on to the end of this one to make a full length station. That's all for now, but hopefully progress reports will be a little more frequent now! Perhaps I need to make a Trello task to update my blog?